Being able to use soccer moves to beat defenders at will is a highly prized skill as coaches look for players who can unlock the tightest of defences. Players who have close ball control, quick feet, and an endless bag of soccer tricks and moves are some of the most important players on a good soccer team. 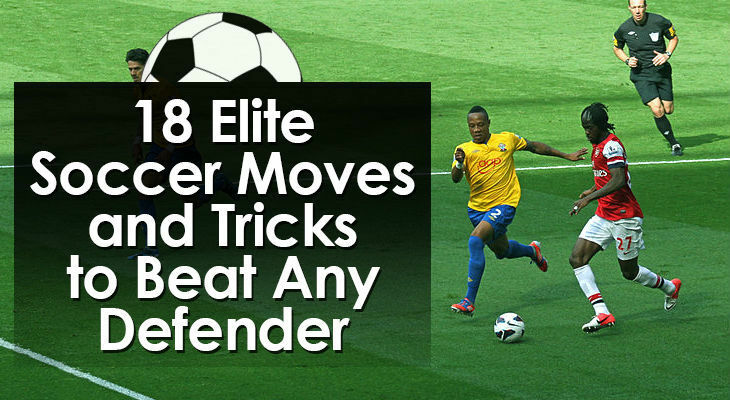 There are hundreds of elite soccer moves to master. All of them require hours upon hours of practice in order execute them with confidence. Below, I’ll break down 18 tricks you can use to get by even the toughest of defenders. Zidane and Maradona often used it and looked effortless when they did. Also known as the 360, this soccer move uses a spin to create separation from defenders and win yourself some extra time and space. With the ball running in front of you and the opposition player close to putting in a tackle, put your inside foot on top of the ball and roll it back slightly. At the same time, spin your body and roll the ball with your outside foot into the direction you’re turning towards. If done correctly, the ball should now be in your path as you sprint by the defender. Johan Cruyff used to turn defenders in and out with this signature move. The Cruyff Turn is executed when pretend you’re about to put in a cross, but actually use the interior of your foot to drag the ball back through your legs. When done correctly, this soccer move not only throws the defender off balance, but also allows you to keep possession and get past your opponent with a minimal risk of losing the ball. While attempting the Cruyff Turn, you must ensure that your body has low gravity as this will help you to turn quickly and keep your balance. Commit to the turn and execute it as quickly as you can in one fluid movement. The Elastico (also known as the flip flap) has long been popular with Brazilian soccer players who have used it to devastating effect on the pitch. In particular, Ronaldinho as you’ll see in the video below. To pull off this soccer move successfully, you want to hit the ball with the outside of your foot before immediately changing direction by striking the ball with the inside of your foot and bringing the ball across your body. Though it can be done from a stationary position, it is a lot more effective at speed. The goal is to make the defender believe you’re going one way when you’re actually going to cross the ball over and go the other direction. The Hocus Pocus is one of the most difficult soccer moves on the list. It takes a lot of skill and ball mastery to pull off, but you’ll certainly leave your defender in a twist if you’re able to master it. Starting with the ball attached to the inside of your foot, scoop the ball behind your standing leg and then push the ball back in front to the same side of your body with the outside of the same foot. Hopefully you’ll tie your defender up in a knot instead of yourself. As usual, the quicker you’re able to do this, the better chance you’ll have of successfully pulling off the move and blowing past your defender. I recommend you practice this from a stationary position first. With the huge range of soccer tricks that you can use, you’ll soon be leaving your defenders knot-legged and twisted all over the pitch. That’s when opportunities to use the nutmeg will arise. Once you’ve sold your defender a couple of dummies and they’re retreating flat-footed and unsure of what to do, slip the ball through their legs for the ultimate humiliation. Then quickly slip past them and gain possession of the ball again. No player likes to be nutmegged and I guarantee it’ll be on their minds for the rest of the match. They’ll think twice before trying to tackle you again. Jay Jay Okocha’s creativity and trickery brought joy to soccer fans over many years. When he used this soccer move named after him, he would throw opponents off balance and dance past them with ease. When moving with pace, roll the ball with the inside of your foot and use your other foot to fake as if to kick the ball. But actually, you want to step over the ball instead. From here, you have a number of options. You can continue on the way the ball is going if your defender bought on the kick fake or you can cross the ball back over to change directions. As it’s a difficult soccer move to execute, a successful rabona will certainly impress the crowd. A player needs to be very confident in their abilities otherwise they risk losing the ball and making a fool of themselves in a promising position. Basically, a player wraps one leg behind the other to put in a cross or pop off a shot. Instead of the ball being in front of you, it needs to be on the outside of your planted foot when executing the move. Your standing leg gives you balance while you aggressively cut your other leg behind and strike the ball. Ideally leaning back while doing this to give the ball more height and power. This trick is simple to perform and is often one of the first soccer moves a player will learn. The key to executing the Rivelino during a game is to sell the initial movement to make your defender think you’re going to kick the ball. To be as convincing as possible, you need to fully commit to the move. 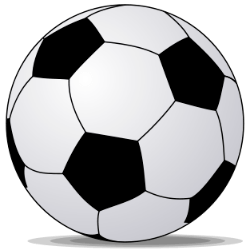 With the ball running in front of you, throw your foot over the ball to appear as if you’re going to kick in one direction before swiftly taking the ball in the opposite direction with the outside of the same foot. The goal is simply to get your defender to off balance and leaning one way so that you can sprint off in the opposite direction with the ball. With this move, you want to appear as if you’re going to pull the ball back to either pass or change directions. This is done by pretending to place your foot on top of the soccer ball before exploding forwards where you’ll have space to shoot or pass to a teammate. This stop-start movement will cause your opponent to slow down and hesitate which will allow you to drift past them with ease. Make sure give your opponent a subtle head fake when you execute this move to really sell it. One of the easiest moves to master, the cut is simple but can be can devastatingly effective. While running towards your opponent with the ball, fake like you’re going to pass or shoot to get them to make a move, then cut the ball across your body and explode by them. A number of fakes (head fakes, shoulder fakes, eye fakes, etc) can increase your likelihood of tricking your defender with the single cut. Named after Sir Stanley Matthews who terrified English defenders in the 1930s-60s, this cut move is fantastic for getting past defenders and is a great skill to have in your back pocket. While running towards the defender in front of you, use the inside of your foot to knock the ball slightly towards the middle of your body and then quickly use the outside of the same foot to cut the ball past your opponent. Although not much trickery is involved in this move, pulling it off is all about timing and how you sell the move with your body to fool the opponent. The Rainbow is an incredibly difficult soccer skill involving flicking the ball over the opponent’s head before regaining possession. As you can probably guess, it’s rarely attempted during a game. But when it is successfully done, it’s impressive. With both feet on either side of the ball, use one leg to roll the ball up the back of your other leg before flicking the ball up and over the head of your opponent. If this is move you want to use, make sure to practice from a standing position before attempting to do this while on the move. While most of the soccer moves mentioned on this list are useful for game situations, you should probably keep the Rainbow locked safely away for when you’re mucking around with friends. This move was pioneered by Cristiano Ronaldo and is great for getting past defenders. And while it looks impressive, it’s relatively straightforward to learn. While sprinting along the flank and when an opposition defender is sprinting alongside you, strike the ball with the inside of your foot and cut it behind your standing leg. The ball should end up on the opposite side from where you kicked it and both feet should rise of the ground as you make contact with the ball. To stop this move, defenders may be forced to bring the dribbler down otherwise they’ll have a free run at the goal. The Inside Hook move is used to slow down the play, not necessarily to beat your opponent off the dribble. To use it, show the ball to your opponent and open your body up looking like you’re able to attempt a move to blow past the defender, but instead hook the ball with the interior of your foot and slow it down. This drag move will give you time and space to make another move directly after, switch the play, or pass back to a teammate. Completing this move successfully requires a high level of ball control and patience. Great for eluding players while in a tight spot on the wing, this particular pull back move is simple but relies on great timing in order to execute it correctly. To do it, place your foot on top of the ball and drag it back towards you as the defender reaches in to knock the ball away. Then immediately push the ball out past their leg with the same foot. This creates the ‘V’ shape. Unlike many of the other soccer moves, the pull back V is done from an almost stationary position as it’s nearly impossible to do while sprinting. Also known as ‘scissors’, step overs are designed to confuse your opponent by throwing your feet around the ball and keeping them clueless about which direction you’re going to dribble. You want to perform this soccer move as quickly as possible while keeping balance as the whirr of your feet makes it even harder for defenders to anticipate which direction you’ll go. While keeping your knees slightly bent, throw one foot around in front of the ball without making contact and then and then explode past your defender. You can add multiple step overs to increase your defender’s confusion. Once they have been thrown off balance, knock the ball past them and sprint on towards goal. Another one of the easier soccer moves to master is the single lunge. It’s a simple trick, but can be incredibly effective to help you evade opposition defenders. While sprinting towards your opponent, lunge to one side without making contact with ball (basically a shoulder / head fake), and then use the outside of your foot to explode the opposite direction away from the defender. It’s a simple dummy and relies on the dribbler selling the move with the fake. Once you’ve got the single lunge figured out, a great way to increase the effectiveness of this move is to simply increase the number of lunges you give to the defender. While dribbling towards your opponent, lunge one direction and the lunge the opposite direction before changing back to the original side and using the outside of your foot to push the ball past the backpedaling defender. Multiple lunges will almost certainly get them off balance. To appear especially convincing, the first lunge should be short and sharp while the second lunge should be a little bit longer to make it seem as if you’ve committed to that direction. As you can see, there is a huge range of soccer moves you can use to beat a defender. Committing several (or all) of these soccer moves to memory will make you more valuable to your team, will increase your time and space on the pitch, will result in more goals and assists, and will create more opportunities for your teammates. To start off with, pick out a couple of your favorites and spend time practicing them. That way you’ll always be able to evade your defender or get out of a tight spot.